I have to mention Mr. Eugene Kohn. He conducted for Mr. Bocelli tonight and conducted for Mr. Domingo (along with the Omani Orchestra) last time he was here…. This was his 3rd trip to Muscat and I hope that we’ll get to see him more often now that we have our own Opera house!! !….I have said this before and I will say it again! We are so lucky to have this Opera house right here at our door steps!… It has been a great season so far. We just came back from a lovely evening… and I must say that Turandot was just amazing …. 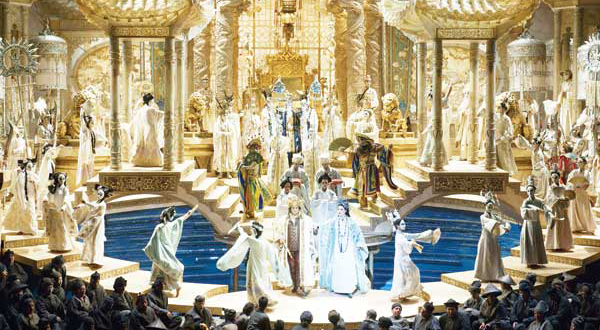 Franco Zeffirelli was the directer and the set design as well…. the set was honestly out of this world … but the star of the evening was Plácido Domingo he was the Maestro tonight. Turandot is the beautiful cold-hearted femme fatale princess who basically lures love-struck princes to their death. Anyone who wants to marry her is asked three riddles: If he answers them right he gets to marry her, but if he doesn’t he is beheaded. This is stated at the very beginning of the opera as “the law” (“La legge è questa”). In a square filled with people near the Forbidden City, a Mandarin reads an edict: any prince seeking to marry Princess Turandot must answer three riddles – and if he fails, he will die. Her latest suitor, the Prince of Persia, is to be executed at the rise of the moon. Bloodthirsty citizens urge the executioner to go ahead, and in all this chaos a slave girl called Liù, cries out for help when her aged blind master is pushed to the ground. A handsome Prince recognizes him as his long-lost father the King Timur, who fled a long time ago. When the old King tells his son, Prince Calàf, that only Liù has remained faithful to him, the Prince asks her why. She replies it is because once, long ago, he Prince Calàf smiled at her…… The crowd cries for blood again….. the moon emerges, and everyone falls into sudden, fearful silence. The doomed suitor passes on the way to execution,the crowd feels sorry for him and asks Princess Turandot to spare his life. Turandot appears and, with a small gesture, bids the execution to proceed. The crowd hears a death cry from a distance…… Calàf, falls in love with the princess at 1st sight, and is determined to win her heart, striding to the gong that proclaims the arrival of a new suitor. Turandot’s 3 ministers and advisors Ping, Pang and Pong try to discourage the unknown Prince, they warn him that he will die…..Timur and Liù also warn him and beg him to change his mind…… But despite their pleas, Calàf strikes the fatal gong and calls out Turandot’s name. Ping, Pang, and Pong prepare themselves for either a wedding or a funeral!!! The crowd cheers for the triumphant Prince. Turandot throws herself at her father’s feet and pleads with him not to leave her to the Prince’s mercy. The Emperor insists that an oath is sacred, and it is Turandot’s duty to wed the Prince. As she cries out in despair, the Prince stops her, saying that he has a proposal for her: “You do not know my name. Bring me my name before sunrise, and at dawn (all’ alba), I will die.” Turandot accepts. The Emperor declares that he hopes to call the Prince his son come sunrise. I know that it doesn’t look like a smart move from the Prince, I mean he has already won right? So why should he give her another chance to get away?…. You see, nothing in this opera makes sense if taken literally…… the Prince’s statement here is poetic. He actually wants to “lose” !!!! he wants her to tell him his name and he wants to “die.” The Prince tells Turandot “Bring me my name before sunrise, and at dawn I will die.”…. Notice that he does not say IF you guess my name…. He doesn’t want to force her to marry him he wants her to fall in love with him….so in other words he wants her to find out his name and to choose not to execute him!!!! The Prince tries to convince Turandot to love him by kissing her. At first she is disgusted ofcourse, but after he kisses her, she gets overwhelmed and admits that, ever since he came, she had both hated and loved him…… She begs him to ask for nothing more and to just leave, and taking his mystery with him. But the Prince, reveals his name to her, “Calàf, son of Timur” and places his life in her hands!!! Turandot and Calàf approach the Emperor’s throne. She declares that she knows the Prince’s name……. “Amore” ……The crowd cheers. Here is a translation of my favorite aria Nessun Dorma though in my opinion the libretto of Opera Turandot in general doesn’t translate easily because it’s very poetic….. I don’t mean just the lyrics, but the entire plot doesn’t make much sense if taken too literally…. but for what it’s worth here it is! And we must, alas, die. All’alba vincerò! Vanish, o night! At daybreak, I shall conquer!